You don’t have to sacrifice style for energy efficiency! Here’s how to beat the heat — and boost your home’s aesthetic appeal in the process. It’s almost that time of year where any room in the house is a welcomed relief from the outdoor heat — as long as it’s air conditioned! But your ice-cold interiors come with an associated cost for your utilities, and if you’re not careful, that first summer electric bill can be a shock. While it’s tempting to just hop over to the thermostat at the first sign of sweltering weather, you do have other options. Efficient treatments like awnings and heavy curtains offer plenty of in energy savings, and they can spruce up your home’s windows, too. Here are some of our favorite ways to beat the heat and boost aesthetic appeal in the process. Exterior window coverings have come a long way from the candy-striped canvas awnings we all know from our local pizza parlor or bodega. Custom-designed acrylic or polycarbonate canopies can be manufactured in curved shapes that make modern accents to entryways, while long angled metal awnings positioned over large windows or outdoor living spaces have a more industrial swagger. These kind of additions can have a major impact on your cooling needs, as well. Awnings installed over south-facing windows may reduce solar heat gain (SHG) by as much as 65%, while west-facing awnings stand to lower SHG by up to 77%. 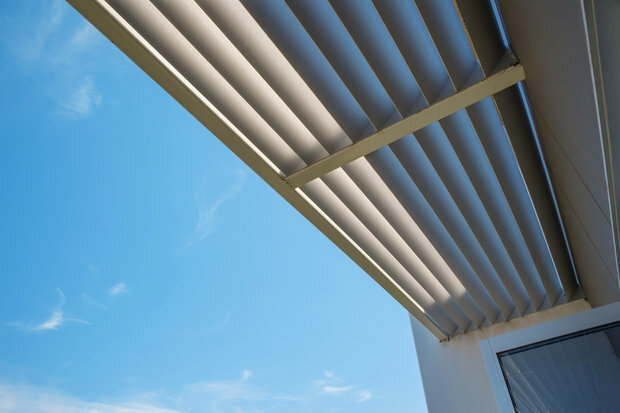 The angle of the overhang can make all the difference, so if you’re designing a permanent overhang or custom awning, it may pay to consult with an architect or contractor who has experience with passive solar design. Dramatic draperies are both fashionable and energy-forward. The Department of Energy notes that the right kind of draperies can reduce solar heat gain in homes by as much as 33 percent. What does the “right kind” mean? For starters, there’s the weave. Heavy, closed-weave fabrics, such as broadcloth or velvet, block the most sunlight and heat. If you can get them with a white plastic backing, even better. Don’t be stingy with the fabric, either: extra folds and pleats reduce the amount of heat radiated back into interiors through the process of convection. Pull the drapes shut during the day and you’ll have an instant cooling boost! Looking for something unusual to fill out your bedroom decor? 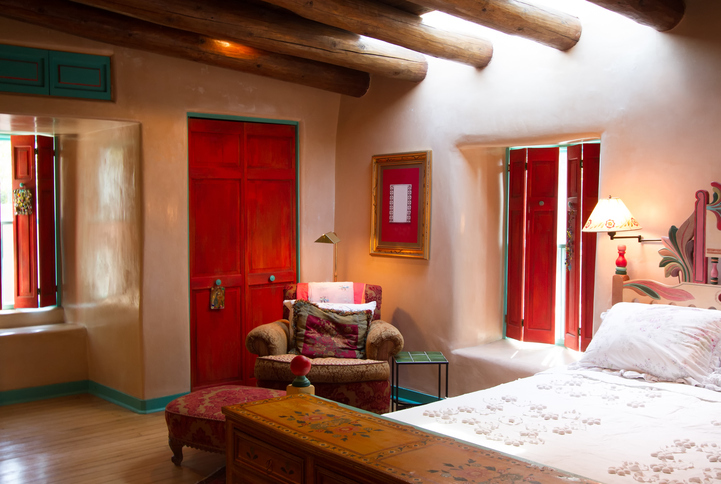 This year’s trendsetters have been all about solid interior shutters on bedroom windows—which, coincidentally, have plenty to offer in terms of energy savings, as well. Wooden shutters shade and cool interiors by blocking out excess heat and light. They also prevent light pollution from entering your room while you sleep, which makes your bedroom extra comfy day and night. Solid panels make a cozy addition to any home, especially when paired with large, energy efficient windows that will allow you to throw open the shutters when you want to let a little daylight inside—without suffering the effects of excess heat in the process. Good looks and energy smarts? This summer is definitely off to a very good start!